Since the first report of high optical transmission in subwavelength hole arrays1, transmission and field enhancement properties of electro-magnetic waves in subwavelength metallic apertures have drawn much interest2. 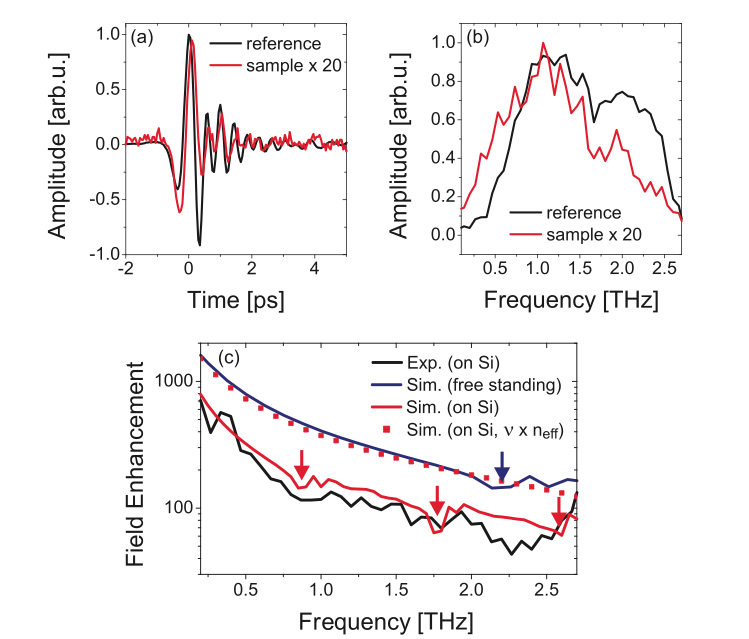 In the THz regime, field enhancement is of importance due to the present technological limitations in the peak fields, obtainable from current THz sources, that limits the realization of nonlinear THz experiments. Recently, Seo et al. 3 reported a field enhancement factor F approaching 780 at 0.1THz using a single 70nm wide slit etched in a thin gold film. A single slit can be depicted as a nanocapacitor loaded with the charge collected by the surrounding metal surface. When THz radiation impinges on the metal sheet, light-induced current creates transients of charge imbalance across the gap. This imbalance, in turn, leads to a field enhancement inside the gap that scales with the incident wavelength. Despite the high field enhancement obtainable in single slits, such structures tend to suffer from a low field transmission T, which could in principle be increased by arranging the slits into arrays. However, the net charge imbalance depends on the current induced within a finite collection area around the gap. Hence, as the spacing between the slits decreases, the collected charge per slit, and therefore the overall field enhancement factor, decreases. A compromise can be found to obtain reasonable values of F and T by optimizing the array parameters. Fig. 1. (a) Schematic illustration of a 1D nanoslit array. (b) Scanning electron microscope image with the inset showing a zoomed-in image of one of the slits. By careful design of a nano-slits array (Fig. 1), we managed to significantly improve the transmission of the structure while preserving the high enhancement obtainable in a single slit structure. We experimentally demonstrated 1D arrays of nanoslits featuring high T while preserving high F in the frequency range of 0.2 – 2.7 THz (Fig. 2). [Appl. Phys. Lett. 99, 041110 (2011)]. Fig. 2. (a) Time profile of THz pulses transmitted through an unstructured Si substrate and the d=100 m slit array. (b) Corresponding spectra. (c) Simulated enhancement fac- tor for a freestanding d = 100 m array, the slit array on sub- strate, and the field enhancement obtained from the mea- surement. The arrows mark spectral modulations related to grating modes. T. Ebbesen, H. Lezec, H. Ghaemi, T. Thio, and P. Wolff, Nature 391, 667 (1998). F. J. Garcia-Vidal, L. Martin-Moreno, T. W. Ebbesen, and L. Kuipers, Rev. Mod. Phys. 82, 729 (2010). H. Park, Y. Park, H. Kim, J. Kyoung, M. Seo, D. Park, Y. Ahn, K. Ahn, and D. Kim, Appl. Phys. Lett. 96, 121106 (2010).